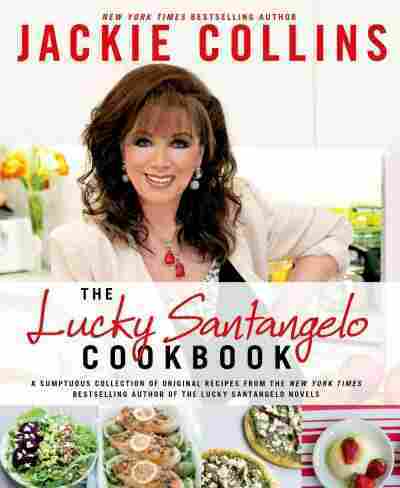 Interview: Jackie Collins, Author Of 'The Lucky Santangelo Cookbook' Collins' The Lucky Santangelo Cookbook is named for her plucky heroine, the daughter of a former gangster. It's got recipes for linguine and the author's eponymous cocktail — but no health food. Lucky Santangelo is a household name — at least, in those households where the shelves are packed with Jackie Collins novels. And considering there are more than 500 million copies sold, well, Santangelo's certainly got a fan base. She's the heroine, more or less, of seven Collins novels, including Vendetta: Lucky's Revenge, Dangerous Kiss, Drop Dead Beautiful, and Goddess of Vengeance. And Santangelo herself is a bit all of those things: the beautiful daughter of a former mob boss who has her own way of making offers people can't refuse. One of Santangelo's weapons is food, which is lavishly prepared for the people she cherishes — unless, of course, they get in her way. Collins' latest book, The Lucky Santangelo Cookbook, is a peek into her character's kitchen. It's full of recipes for everything from meatloaf to creme fraiche with chocolate mousse. One thing you won't find is a focus on nutrition: "It's not a healthy book," Collins tells NPR's Scott Simon. Collins discusses her approach to cooking vegetables, shares the inspiration behind her first novel and — to Simon's shock — reveals that she once threw Alec Guinness over her shoulder. That is absolutely delicious. I mean, you just cover everything in this fabulous cheese, and you melt it, and you make the vegetables very ... edible. Because most kids are used to vegetables that they get at school, and they're disgusting! So they go off vegetables ... if I'm going to do vegetables, then I want them to be absolutely delicious and delectable. Actually, I was always an out-of-work writer, and I only did movies when I was a teenager and I was expelled from school, and my parents said to me, "Oh, you know, your sister [Joan Collins] is doing movies in Hollywood, she's a big star out there, you can go and do the same thing, you're not bad-looking." And I thought, "Well, I'll make some money making these movies playing the Italian girl," which is what I always seemed to be cast as. And I did it for, you know, a couple of years when I was a teenager — I had to throw Alec Guinness over my shoulder in one movie. I wanted to write and turn the double standard on its head. ... And then I said, this is ridiculous, I have to start on my writing career. So I wrote a book called The World is Full of Married Men, because I found that in my teenage years married men would be chasing me everywhere and going, "Oh, yeah, well, my wife is different, but you know, she doesn't really understand me." And I thought, "This is so interesting!" And I wanted to write and turn the double standard on its head. And then eventually I created Lucky Santangelo. ... She's such a brilliant character because she does all the things that women would like to do, she says all the things they would like to say, and she gets away with it. On the lemon linguine, a Santangelo family favorite. It is a family favorite, and they love it with the creamy sauce... I know, it's terrible the way I use cream and butter. But I think if you're going to indulge yourself, you may as well indulge, you know? And that's what the family does. I do think you can treat yourself. And I believe in chocolate — there's some great chocolate desserts [in the cookbook], like the molten chocolate and some pies and things like that. ... So I have used a lot of things in the book that probably are forbidden in most books. Because I look on the bestseller lists and I see "how to be healthy," "how to eat healthy," "how to do this" and "how to do that." But what the hell, we're only here once. Let's have some fun. 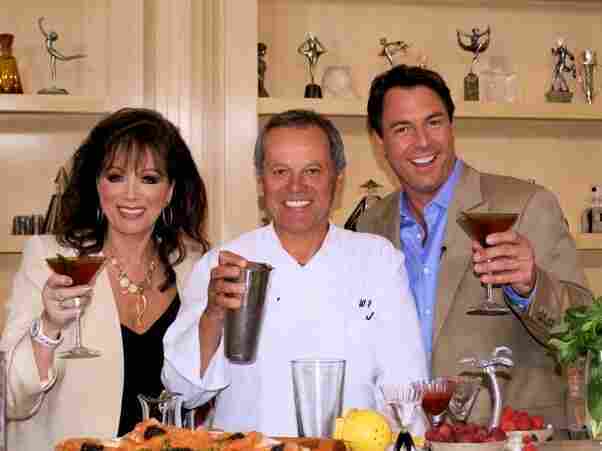 Jackie Collins, the author of nearly 30 best-sellers, wrote her cookbook with Wolfgang Puck (center) and Mark Steines. From THE LUCKY SANTANGELO COOKBOOK by Jackie Collins. Copyright 2014 by Chances, Inc. and reprinted by permission of St. Martin's Press, LLC.